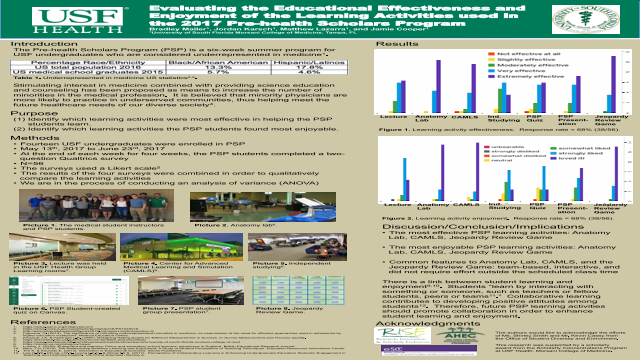 Abstract: The goal of this project was two-fold: to identify which learning activities were most effective in helping the PSP students learn and to identify which learning activities the PSP students found most enjoyable. Each week, we used the same learning activities: (1) lecture, (2) anatomy lab, (3) CAMLS, (4) independent studying, (5) PSP student-created quiz, (6) PSP student-led team-based active learning (TBAL) presentation, and (7) jeopardy review game. (1)	Lectures were held daily. (2)	Each anatomy lab session lasted about one hour. (3)	First-year medical residents led weekly CAMLS activities. (4)	Students were expected to regularly review the material outside of scheduled class. (5)	The PSP students submitted two original, relevant multiple-choice questions. The medical student instructors graded the assignment and combined the questions into a quiz. (6)	A group of 3-4 PSP students delivered an oral presentation about a disease of their choosing. (7)	Every Friday, we played a 50-question, team-based jeopardy review game. We sent out weekly Qualtrics surveys consisting of two questions. The first question used a 5-point Likert scale to gauge how effective each teaching method was in helping the students learn. The second question used a 7-point Likert scale to assess the students’ enjoyment of each teaching method. The weekly results were combined in order to assess the quality of each learning activity over the entirety of PSP. The overall survey response rate was 68% (38/56). Independent studying, our control, had the lowest educational effectiveness rating, receiving mostly ‘moderately effective’ and ‘very effective’ ratings. The most effective learning activities were anatomy lab, CAMLS, and the jeopardy review game; all of which received at least 90% ‘extremely effective’ or ‘very effective’ ratings. Independent studying had the lowest enjoyment rating as the majority of responses indicated ‘somewhat liked’ and ‘strongly liked’. The most enjoyable learning activities were anatomy lab, CAMLS, and the jeopardy review game; all of which received at least 75% ‘loved it’ ratings and at least 13% ‘strongly liked’ ratings. Figueroa, O. (2014). The significance of recruiting underrepresented minorities in medicine: an examination of the need for effective approaches used in admissions by higher education institutions. Medical Education Online. Krosnick J.A. & Fabringer L.R. (1997). Designing Rating Scales for Effective Measurement in Surveys. In Survey Measurement and Process Quality. Lumby, J. (2010). Enjoyment and learning: Policy and secondary school learners’ experience in England. British Educational Research Journal.